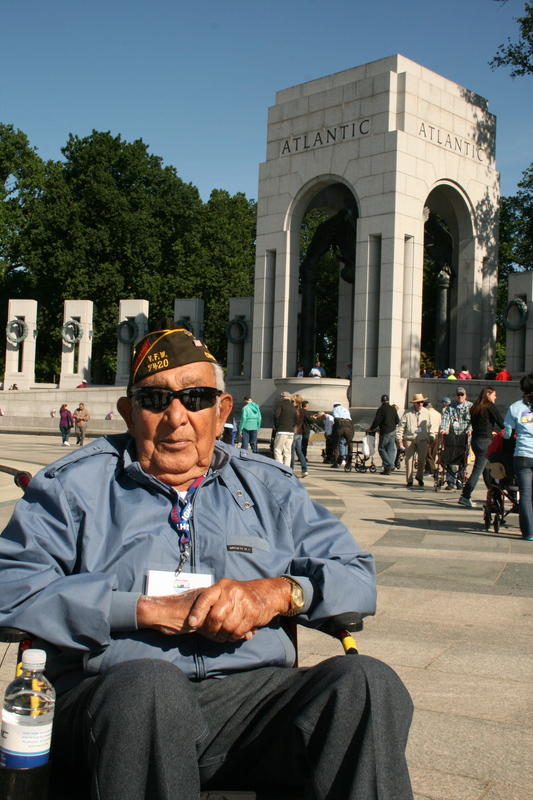 The buses that took us into Washington D.C. were filled with men no younger than 87. They had loose, weathered skin and clouded eyes. Any tattoos had faded to beyond recognition. They played a video on our bus that told the story of World War II and the building of the war’s memorial on the Washington Mall, which was our destination. 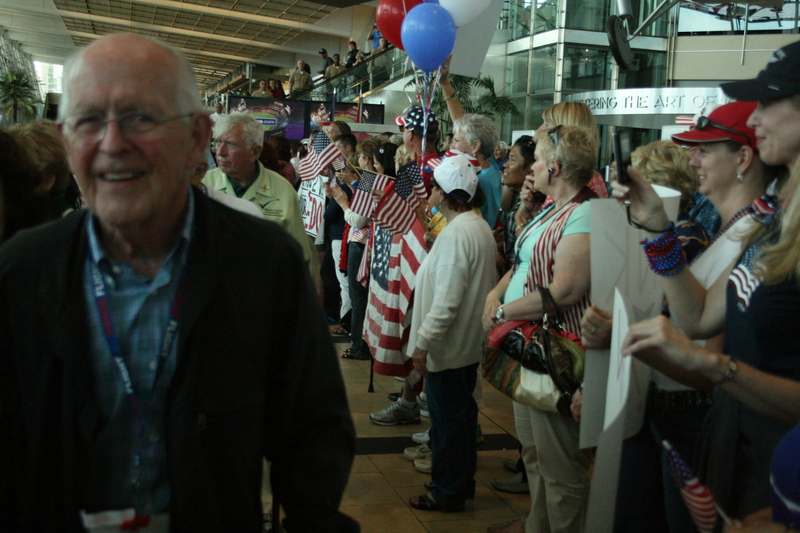 The flight that took these WWII veterans all the way from San Diego was called Honor Flight. It was one version of similar trips that originate all around the country. It was Memorial Day weekend and these vets were celebrated from the time we landed in Baltimore, where they were greeted by sailors in white uniforms and soldiers in camouflage and where travelers waiting at their gates applauded the elderly former warriors. Jim Fudge, Navy veteran on Honor Flight, meets appreciative crowds at Lindbergh Field. 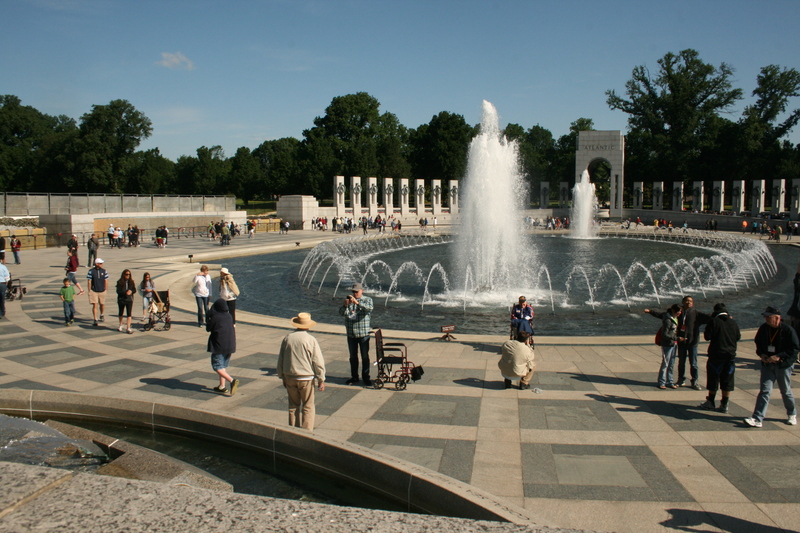 When we visited the WWII Memorial in Washington the vets walked up to a balcony above the floor of the monument where a bunch of high-schoolers applauded as if each of the old guys were the Pope, especially the frail men in wheelchairs who rose to wave to their admirers. I thought that was impressive until the trip was over and we landed again at Terminal 2 in San Diego, where an even longer line of sailors began of corridor of cheering, patriotic crowds who numbered in the thousands. Boy scouts, school kids and their moms and dads were holding signs that said things like “honor our heroes” as they hooted and clapped by baggage claim. If I had been one of the veterans I’m not sure if I’d have been thrilled or embarrassed. 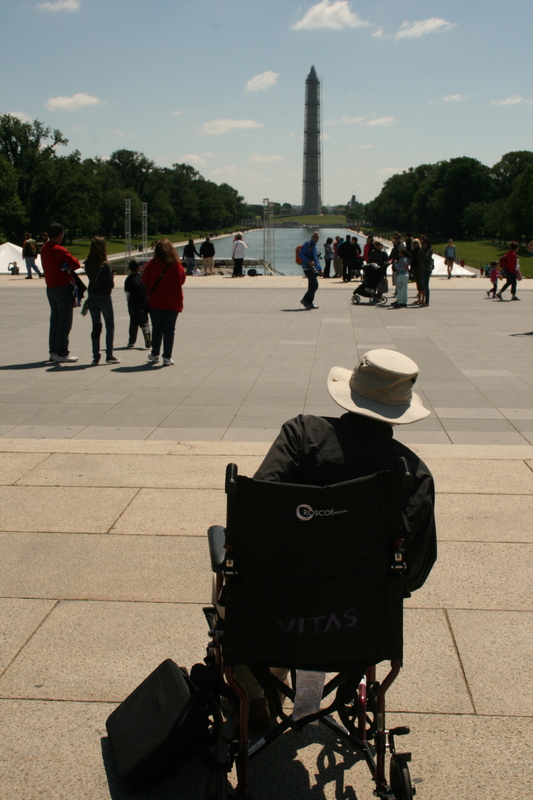 I will admit I gladly used a wheelchair to help ply the paths between the Lincoln, Vietnam and Korean War Memorials. The several hundred yards of distances we had to cover went a lot faster with dad seated and us not having to move in time to his halting gait. Sometimes I wondered about the constant congratulations and the endless wishes of “We thank you for your service.” But I learned something about this country’s deep love of WWII and its memories. As I rode in from Baltimore on the bus that video told us of the victory of democracy over fascism. I thought… the mythic embodiment of America could not be more perfect than what we saw in that war. In it, we conquered racism, fascism, dictatorship, not necessarily in that order and not without a lot of help from other countries but we did it. It was the good war that ended in unquestionable victory. The contrast with some of our other wars had occurred to me but never more powerfully, thanks in part of the other war memorials on the Mall. At the black walls of the Vietnam Memorial we asked a volunteer to climb a ladder so he could reach and trace for us one of the walls’ indented names, “Clifton Cushman…” a man whose father was a friend and colleague of my dad and whose aircraft went down over North Vietnam. The crosshatch next to his name showed that he was never seen again by Americans. He is an MIA. Even more graphic in its expression of mixed feelings was the Korean War Memorial, which I’d never seen before. Nineteen sculpted soldiers were reflected in its polished wall to symbolize a total of 38, symbolizing the 38th parallel that still separates North and South Korea. The memorial reminded everyone that the Korean War ended in stalemate, not victory. Our day in D.C. was fun and often inspiring even though I saw one too many war memorials for my attention span. I guess the trip wasn’t really meant for me. Our dinner programs at the airport Hilton were not inspiring, neither from the standpoint of food nor speeches. On Saturday night we heard from a Navy commander who spoke at length about the vets’ willingness to make the ultimate sacrifice. I didn’t disagree with him but I also thought there was a difference between the WWII vets and this career Navy guy, whose passions clearly ran toward military discipline and a devotion to the risking all. The guys who served in WWII were just guys. They were planning to be farmers, factory workers, teachers, scientists or postmen. They might have burned with a patriotic fire after Pearl Harbor was bombed and they clearly loved their comrades in arms. They may have even enlisted, but a lot of them were drafted. Maybe they wanted to fight but I’m guessing most of them just wanted to find a way out of their dreary hometowns and go somewhere they might meet some beautiful, exotic women. When the war was over they were glad to be back in the states and (I know this because I asked them) they are still glad Truman dropped the bomb so they wouldn’t face the death and danger that would come with the invasion of Japan. The other thing about these vets is they were so goddamn lucky: Lucky to survive the war and lucky to live to such a ripe-old age. May dad was lucky to have a German torpedo hit the hull of his ship and throw him out of his bunk in the middle of the night, but it ended up being a dud. Erickson, a Swede from Washington State, was lucky when he stood up on a hill his unit was taking in Italy to get shot in the shoulder by a German sniper. The injury sent him home with a purple heart but in one piece. One native San Diegan who was a Mexican-American – yes, they were allowed to serve in the war alongside whites – told me when you went into battle you thought the man next to you might get killed and it was never going to be you. I do believe the lesson of that war was not that there are good and just wars, but that technology has made war more terrible than we ever imagined. The holocaust, the slaughter of Russians and Chinese, the aerial bombing of cities – let the list go on – showed that WWII was only good when it was over. This entry was posted on May 27, 2013 at 5:51 pm and is filed under Uncategorized. You can subscribe via RSS 2.0 feed to this post's comments. You can comment below, or link to this permanent URL from your own site.